Live adult damselflies photographed in the wild at DuPage County, Illinois, USA. 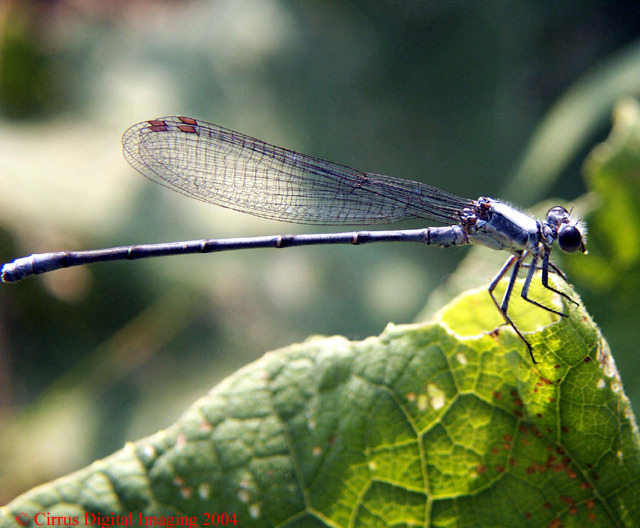 Damselflies complete a life cycle in one or two years. The adults mate over the shallow water, sometimes in flight but often while clinging to the exposed portions of weed beds or shoreline vegetation. Immediately after mating, the female will crawl down the vegetation, and 'into' the water to lay her eggs on the submerged portion of the vegetation. Once the eggs are laid she will crawl back up the vegetation and repeat the process. When the eggs hatch they do not go through the larva and pupa transformations. The newly hatched damsel is just a smaller version of the later immature stages. Thus they are simply called 'nymphs' until they actually hatch into adults. Damselflies undergo incomplete metamorphosis, with an aquatic nympal stage. The female lays eggs in water, sometimes in underwater vegetation, or high in trees in bromeliads and other water-filled cavities. Nymphs are carnivorous, feeding on daphnia, mosquito larvae, and various other small aquatic organisms. The gills of damselfly nymphs are large and external, resembling three fins at the end of the abdomen. After molting several times, the winged adult emerges and eats flies, mosquitoes, and other small insects. Some of the larger tropical species are known to feed on spiders, hovering near the web and simply plucking the spider from its perch there. The damselfly nymph is predacious. Usually it lies in wait for other aquatic bugs to get within range and then grabs them with its 'labium' which is modified lower jaw. The nymph will proceed through 10 to 12 instars, or molts, before becoming fully developed and ready to emerge as an adult. With each molt the nymph becomes somewhat darker in color. Finally the nymph will swim towards the shore and crawl into shoreline vegetation. While clinging to this vegetation the nymph's skin breaks along the wing case and out crawls a shortened version of the adult. Before taking flight, the new adult must pump body fluids into its abdomen and wings. Depending on the species, the adult will live for several weeks to several months before mating and dying.